As part of our on-going research and surveillance work on the UBI market, PTOLEMUS is now able to provide a quarterly update of the state of the telematics insurance market. 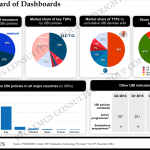 The dashboard is presented in PDF slides with a Dashboard of Dashboards, then a set of slides per country or region with the key market indicators and a recap of the essential news items in the last 3 months. A large set of public information collected from conferences, desk research, etc. You can download the updated 2017 dashboard of dashboard and a sample of the Quarterly UBI Dashboard by filling in the form below.